TAORMINA, Italy – At President Trump’s first major meeting with international leaders, his world influence has become evident as conversations shifted from the bogeyman of climate change to the real and present danger of Islamist terrorism. Prior to the G7 summit of the leaders of the world’s wealthiest and most advanced nations, “climate change” constantly appeared on the list of priorities highlighted by the heads of state especially of European nations. As one headline read, “Trump talks terrorism while Europe shouts ‘Climate!’” In this shouting match, however, the U.S. President has definitely gotten the upper hand. Reality has imposed itself, as a major jihadist attack last Monday in Manchester, England, claimed the lives of 22 persons and gunmen massacred some 26 Coptic Christians Friday morning south of Cairo Egypt. The latter attack coincided with the first day of Ramadan, the holiest season in the Islamic calendar. While the phantasm of global warming hovers over the misty horizon, the reality of repeated slaughters of innocent men, women and children by terrorists inspired by Islamist ideology is an elephant that insists on being recognized. European leaders have also found themselves asked repeatedly to respond to President Trump’s powerful speech against Islamist terrorism before 55 world leaders from Arab and other Muslim-majority nations in Riyadh earlier this week. Asked for a reaction to that speech, the chairman of the European Union’s Council said he agrees with President Trump that the international community should be “tough, even brutal” on terrorism and the Islamic State. 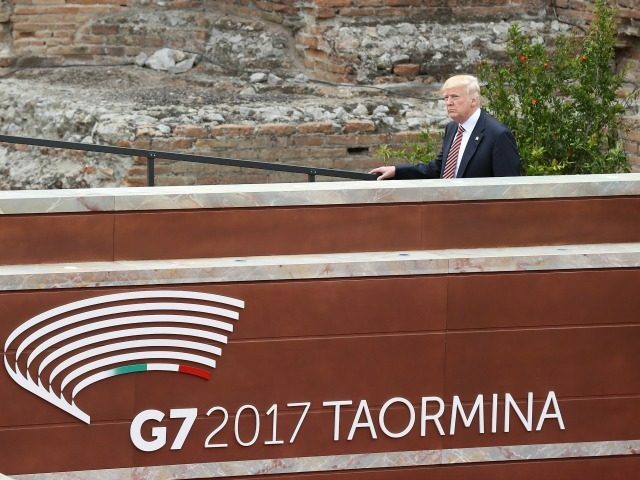 Tusk also recognized that “this will be the most challenging G7 summit in years,” because of President Trump’s independent views that do not always mesh with the European globalist establishment. Throughout the day’s meetings in Taormina, Sicily, President Trump seemed eminently comfortable with his role as world leader and agenda-setter, one which his fellow heads-of-state appeared ill-equipped to counter.